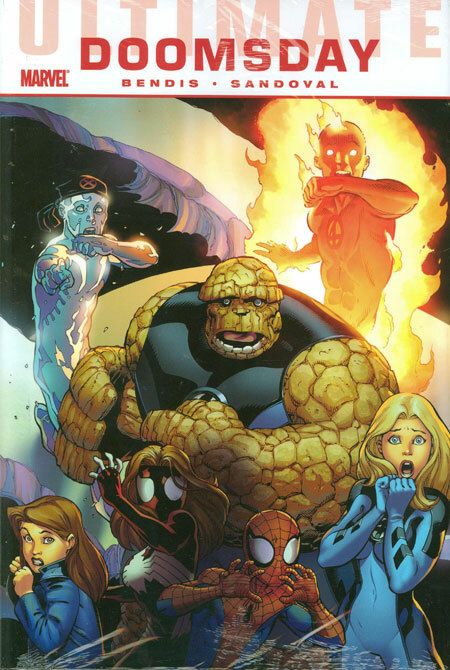 Ultimate Doomsday is a multi-series cross over from the Ultimate Marvel Universe involving Ultimate's versions of the Fantastic Four, Spider-man, Spider-woman, Ice man from the X-men, the S.H.I.E.L.D. side of the Ultimates (many marvel fans know them as the Avengers) in which a number of near simultaneous attacks occur on science institutes and seemingly unrelated people, including the should-be-dead Nick Fury, the home of Reed Richards, the home of Peter Parker and the home of Jessica Drew, Peter Parkers female clone, Spider-woman. The comic follows several paths that lead to the same end, the fantastic four, now the Fantastic three when Reed Richards is seen to die in his home, mourn their loss while Ben Grimm goes into some sort of comma while his rocks fall off, eventually freeing him of his rock cocoon. Spider-man and Spider-woman attempt to infiltrate Roxxon science division to discover if they were involved in the attacks, though their sleuthing gets Jessica in more hot water than she had expected. Finally S.H.E.I.L.D. work every angle they can think of reacting to everything and trying to get ahead of the game. The comic shows all the characters at their best in the middle of such a monumental disaster as they are pitted against an enemy that they never thought they'd have to face. Of course in the end the three groups come together to out-wit their latest adversary, but they don't manage to do away with him. They are most certainly going to have to face off against him again at some point. I'm not going to tell you who it is, but suffice to say I didn't see it coming. There were some great things abotu this comic collection that I think take reading them to understand, but I'll say them anyway; I love the interractions between Spidey adn Spider-woman. They work SO well toghether. I'd say it's like seeing peter parker talkign to himself, but she's his clone so it's kind of redundant. There really isn't enough going on page stuff goign on with Jessica Drew. If I could ask for any one thing to happen with the Ultimate universe... well it'd be Peter Parker coming back, but I can't really see that happening any time soon (though I have a great plot line to make it happen, but you'll have to wait for the Ultimate Spiderman review for that). But if I could have anotehr wish it'd be to put Jessica Drew in her own comic. It was nice to see her confronting her past, facing off agaisnt Doc Oc and inevitably giving in to Peters morals and saving his life. Jessica is a fun, lively, intelligent, entertaining and witty character and we need see more of her. Another thing I loved was a short cameo of Hawkeye, in which he turns up for five minutes to torture an alien creature that nobody can get to talk. He is a legendary agent and suffice to say, the alien talks... in about 30 seconds. Really though, its a great read. Smart, excting, funny and surprising. it makes you think, its emotional and it has some sensational art. Go read it now.